My Grandad loved a list. He recorded every book he ever read between 1933 and the early 1970s, using different colour pen to show whether he felt they were good, fair or poor. He also recorded every journey he took in his Morris Minor Traveller, noting where he went, how far it was and the cost of fuel. Quite a geeky thing to do I know. But all these years later, I like to occasionally leaf through the notebooks and get a bit nostalgic. Grandad isn't alone in loving a list, I certainly inherited the trait. Many of us use them every day. From the mundane shopping list to the more exciting list of holiday ideas. Not forgetting, best of all, the Christmas wishlist for Santa! Whilst paper can work well, it can also be pretty limiting. Scraps of paper are easily lost, never to hand and can't easily be managed across lots of people. No, much more practical to take advantage of modern technology and use the gadgets that are always with you. 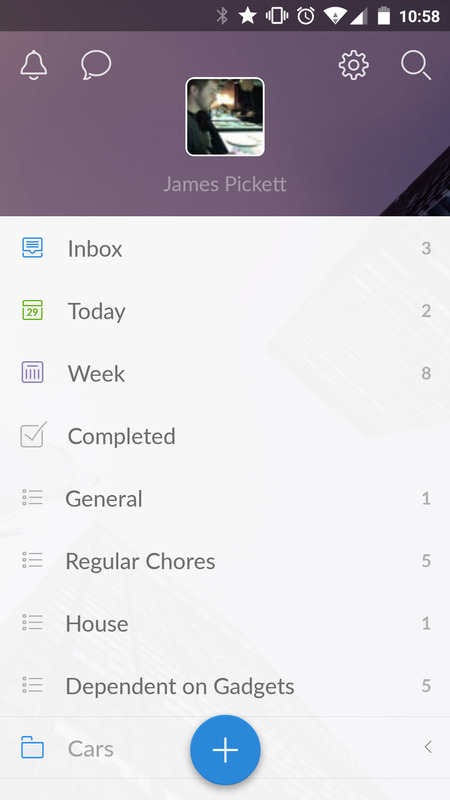 I've been playing with list apps for a while and I've finally found one I'm excited to share with you. Wunderlist! After you sign up for a free account, it’s time to create your first list. The web-app on your desktop computer splits the screen in two, with the smaller left hand column listing your, er, lists and the right hand column displaying the list items themselves. Hit the + button at the bottom of the screen and a pop-up appears. Here you add the list’s title and invite your family/colleagues/friends to have access to the list. Yes, that’s right, your Wunderlists can be collaborative. This opens up all sorts of exciting possibilities. List items themselves need not just be a simple line of text. Although if that’s all you need, that’s fine too. Double-click on a list item and you can set due dates and reminders. This is great, because it means your phone or tablet can beep you when a to do list item is due. There are also extensions for desktop browsers, so you can get alerts on your computer. If you’ve got a real big list on the go, a list item can have a sub-list. This makes it much easier to group more complex tasks into sub-headings and then break down all the steps it takes to achieve that goal. If you’re collaborating, assign these tasks to others and you’ll all be able to keep up with the progress together. Used well, running a household or workplace team on Wunderlist could really increase efficiency! Finally, you can attach files and comments to tasks, which is a great way to break out from having to use email and automatically keeps your digital conversations in context. I’ve been using Wunderlist for about a month now and have found it useful for running the house (the dull stuff, but it’s got to be done) and keeping lists of books I want to read, movies I want to see and so on. Professionals may need to consider the premium version, which removes some restrictions on number of files you can attach and task assignments you can make. But smaller teams and home users should be just fine on the free version. Day to day, I’ve loved being able to separate out my to do lists (bills, pets, cars etc) so that I can manage them each without the distraction of the other - but - when I’m working through the lists actually getting stuff done, using the ‘Today’ and ‘Week’ view filters all my items into the order they’re due, regardless of which list they were created in. Wunderlist is available on all major smartphone and tablet platforms. Just like the web-app, they’re beautifully designed and each is sympathetic to its host device without reducing functionality. Whilst my lists will never wind up in a leatherbound notebook for my grandchildren to discover, I’m sure my Grandad would approve of Wunderlist. It manages to retain the practicality and fun of making lists, but they’re with you everywhere, on every device and sharable. The humble list has well and truly joined the 21st century.